(Photo: ROBINSON NIÑAL JR./ Presidential Communications Operations Office (Philippines))President Rodrigo Roa Duterte and U.S. President Donald Trump discuss matters during a bilateral meeting at the Philippine International Convention Center in Pasay City on November 13, 2017. Church and human rights groups in the Philippines have condemned the "red tagging" of at least 600 activists listed by the government as communist rebels including a United Nations special expert. "Red-tagging" or accusing people of being communist has become a common practice of the military to harass perceived critics of the government, they said. Among those on the list is Victoria Tauli-Corpuz, special rapporteur on the rights of indigenous peoples at the United Nations, Ucanews reported on March 12. UN human rights experts had on March 8 expressed grave concerns about terrorism accusations levelled against the UN Special Rapporteur on the rights of indigenous peoples, Tauli-Corpuz, a Philippine national. Tauli-Corpuz, a known advocate for the rights of Philippine tribal people, denied the allegation, calling the list "baseless, malicious, and irresponsible." The Philippines Department of Justice submitted the 55-page list before a Manila court last month for the processing of arrest warrants and filing of cases. President Rodrigo Duterte earlier labelled the Communist Party of the Philippines, and its armed wing, the New People's Army, as terrorist organizations. UN special experts said that the legal petition listing her name is an unacceptable attack against the mandate holder by the Philippines Government. "We are shocked that the special rapporteur is being targeted because of her work defending the rights of indigenous peoples," said Michel Forst, the Special Rapporteur on the situation of human rights defenders, and Catalina Devandas Aguilar, chairperson of the Coordination Committee of Special Procedures. In a statement, Human Rights Watch said the Justice Department court petition "is a virtual government hit list" that puts at "grave risk" leftist and human rights activists. "There's a long history in the Philippines of the state security forces and pro-government militias assassinating people labeled as [communist] members or supporters," the rights group said. The group said the government should publicly reject the petition and "ensure the safety of those listed in it, or risk being complicit in the resulting crimes." The Student Christian Movement said the list aims "to further legalize its fascist campaign to stifle dissent." Anje Marquez, the ecumenical group's spokeswoman, said the release of the list "is an attempt to silence critics" and allows security forces to go after people without due process. Cristina Palabay, spokesperson of rights group Karapatan labeled the government's "proscription petition" as "dubious and a maneuver to target persons in progressive organizations." On the list are Communist Party of the Philippines founder Jose Maria Sison and his wife Juliet de Lima who are in exile in The Netherlands. Also listed are Luis Jalandoni and Coni Ledesma of the National Democratic Front who are also in Europe, and Benito and Wilma Tiamzon, consultants during the peace talks. Other names include Beverly Longid, global coordinator of the International Indigenous Peoples Movement for Self-Determination and Liberation, Joanna Carino of the tribal group Sandugo, and Cordillera People's Alliance chairman Windel Bolinget. Many on the list are peasant leaders, union organizers, activists, and human rights defenders. Lawyer Edre Olalia, secretary-general of the National Union of People's Lawyers, said the list "forebodes a prelude to a more intense crackdown" against activist groups. "It is part of a shotgun witch hunt designed to sow and create a condition of widespread and extraordinary fear and panic among the populace," he said. Presidential spokesman Harry Roque, a lawyer, said the Justice Department "would not have filed the petition without evidence." 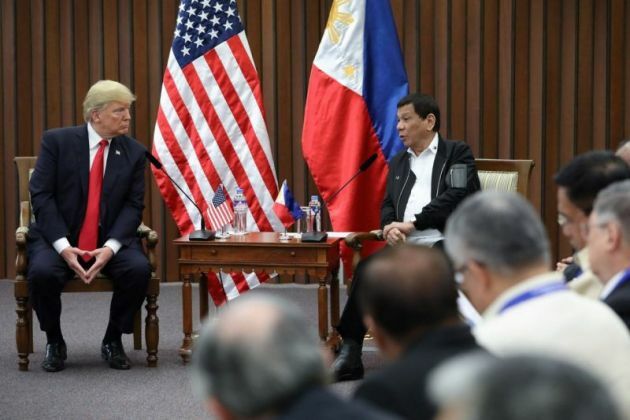 Sister Carmela Adama, spokeswoman of the underground group Christians for National Liberation, said the president is "trying to provoke widespread bloodshed." UN expert Tauli-Corpuz was named in a Philippines government petition filed in February in a Manila court, accused of terrorism and alleged membership of the New People's Army and the Communist Party of the Philippines along with over 600 others. "The accusation against her comes after the public comments made, jointly with other Special Rapporteurs, in relation to the militarization, attacks and killings of indigenous Lumad peoples by members of the armed forces in Mindanao. "This accusation is considered as an act of retaliation for such comments," the experts said. Tauli-Corpuz, in her position as Special Rapporteur most recently addressed the issue in a news release on Dec. 27, which was made in line with the responsibility entrusted to her by the Human Rights Council to report on alleged violations of indigenous people's rights globally. The Philippine's president's spokesperson reacted with hostility to the news release, publicly accusing the Special Rapporteur of seeking to embarrass the Duterte administration, said the UN experts. But the UN experts said, "We call on the Philippine authorities to immediately drop these unfounded accusations against Ms. Tauli-Corpuz and to ensure her physical safety and that of others listed."